Chief Boatswain's Mate James Elliott Williams was a sailor in the U.S. Navy during the 1950s and 1960s. 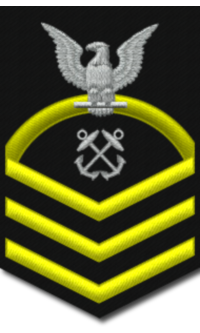 He was the most highly decorated enlisted man in the history of the U.S. Navy. James Elliott Williams was born 13 November 1930 in Fort Mill, SC, and moved two months later with his parents to Darlington, SC, where he spent his early childhood and youth. He attended the local schools and graduated from St. John's High School. He was married to the former Elaine Weaver and they had five children and seven grandchildren. In July 1947, at the age of 16, he entered the U.S. Navy where he served for twenty years, retiring in April 1967. During those twenty years he served in both the Korean and Vietnam Wars. In Vietnam, Petty Officer Williams was assigned to the River Patrol Force whose mission was to intercept Viet Cong arms shipments on the waterways of South Vietnam's Mekong Delta. 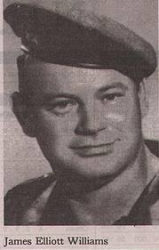 On 31 October 1966, Boatswain's Mate 1st Class Williams, patrol commander for his boat, River Patrol Boat 105, and another PBR was searching for Viet Cong guerrillas operating in an isolated area of the Mekong Delta. Suddenly, Communist guerrillas manning two sampans opened fire on the Americans. When Williams and his men neutralized one boat crew, the other one escaped into a nearby canal. The PBR sailors gave chase and soon found themselves in a beehive of enemy activity as Viet Cong guerrillas opened up with rocket propelled grenades and small arms against the Americans from fortified river bank positions. Against overwhelming odds, several times Williams led his PBRs against concentrations of enemy junks and sampans. He also called for support from the heavily armed UH-1B Huey helicopters of Navy Helicopter Attack (Light) Squadron 3, the "Seawolves." When that help arrived, he kicked off another attack in the failing light, cleverly turning on his boats' searchlights to illuminate enemy forces and positions. As a result of the three-hour battle, the American naval force killed numerous Viet Cong guerrillas, destroyed over fifty vessels, and disrupted a major enemy logistic operation. BM1 Williams not only displayed great courage under fire, but a keen understanding of how his sailors, weapons, and equipment could be used to achieve victory. For his heroic actions, Williams was awarded the Medal of Honor. Place and date: Mekong River, Republic of Vietnam, 31 October 1966. Entered service at: Columbia, SC. Born: 13 June 1930, Rock Hill, SC. Citation: For conspicuous gallantry and intrepidity at the risk of his life above and beyond the call of duty. PO1c. Williams was serving as Boat Captain and Patrol Officer aboard River Patrol Boat (PBR) 105 accompanied by another patrol boat when the patrol was suddenly taken under fire by 2 enemy sampans. PO1c. Williams immediately ordered the fire returned, killing the crew of 1 enemy boat and causing the other sampan to take refuge in a nearby river inlet. Pursuing the fleeing sampan, the U.S. patrol encountered a heavy volume of small-arms fire from enemy forces, at close range, occupying well-concealed positions along the river bank. Maneuvering through this fire, the patrol confronted a numerically superior enemy force aboard 2 enemy junks and 8 sampans augmented by heavy automatic weapons fire from ashore. In the savage battle that ensued, PO1c. Williams, with utter disregard for his safety exposed himself to the withering hail of enemy fire to direct counter-fire and inspire the actions of his patrol. Recognizing the overwhelming strength of the enemy force, PO1c. Williams deployed his patrol to await the arrival of armed helicopters. In the course of his movement his discovered an even larger concentration of enemy boats. Not waiting for the arrival of the armed helicopters, he displayed great initiative and boldly led the patrol through the intense enemy fire and damaged or destroyed 50 enemy sampans and 7 junks. This phase of the action completed, and with the arrival of the armed helicopters, PO1c. Williams directed the attack on the remaining enemy force. Now virtually dark, and although PO1c. Williams was aware that his boats would become even better targets, he ordered the patrol boats' search lights turned on to better illuminate the area and moved the patrol perilously close to shore to press the attack. Despite a waning supply of ammunition the patrol successfully engaged the enemy ashore and completed the rout of the enemy force. Under the leadership of PO 1 c. Williams, who demonstrated unusual professional skill and indomitable courage throughout the 3 hour battle, the patrol accounted for the destruction or loss of 65 enemy boats and inflicted numerous casualties on the enemy personnel. His extraordinary heroism and exemplary fighting spirit in the face of grave risks inspired the efforts of his men to defeat a larger enemy force, and are in keeping with the finest traditions of the U.S. Naval Service. On 14 May 1968, President Lyndon Johnson presented Williams with the Medal of Honor at a White House ceremony. 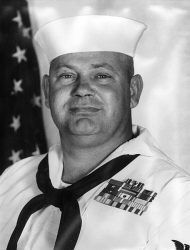 Williams retired from active service with the U.S. Navy in 1967. After his retirement from the Navy in 1967, Williams was employed with the Wackenhut Corporation. In 1969, he was appointed U. S. Marshal for the District of South Carolina where he served until May 1977. He was then transferred to Federal Law Enforcement Training Center, Glynco, GA, as an instructor and National Armorer. He was called back to South Carolina in July 1979 under court appointment as U. S. Marshal for South Carolina and served in that position until April 1980. 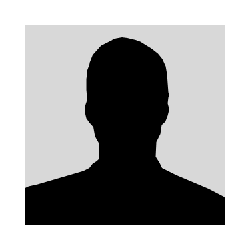 He was then transferred to U. S. Marshal service Headquarters in Washington, DC, as Programs Manager, Health and Safety and In-District Training Officer where he served until his retirement from the U. S. Marshals Service with the grade of GS-18. USS James E. Williams (DDG-95) was named in his honor. Chief Boatswain's Mate James Elliott Williams died on 13 October 1999. He is buried at the Florence National Cemetery in Florence, SC.